Domino’s Pizza is a pizza delivery and take-out restaurant chain headquartered in Ann Arbor Charter Township, Michigan in the United States. The company was founded as a one-store operation in 1960 by brothers Tom and James Monaghan when they purchased a pizza store named DomiNick’s located in Ypsilanti, Michigan. In 1965, the company was renamed Domino’s Pizza. The previously privately held company went public in 2004 and is now traded on the New York Stock Exchange. As well as pizza, the chain offers a range of other dishes including pasta, oven-baked sandwiches, fried chicken, side dishes and desserts. Domino’s Pizza accounted for almost 6 billion U.S. dollars in systemwide sales in 2017, making it one of the top pizza restaurant chains in the United states, and placing it in the ranking of the top quick-service restaurant chains. The company operates almost 16,000 stores worldwide of which the largest share is located in the United States. Of almost 5,900 Domino’s locations in the United States in 2018 only 390 are company-owned, as the majority of Domino’s stores are franchised. 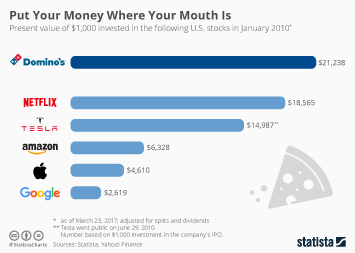 In the United States Domino’s is the top pizza chain in terms of sales however, it remains second to Pizza Hut in units. Domino's ranked above it's competitor Pizza Hut, but below Papa John's in a survey on consumers' favorite pizza chains, coming in sixth place overall. However, according to the American Customer Satisfaction Index (ACSI) carried out in 2018, Domino’s restaurant chain ranked below the average limited service ACSI score of 80, receiving a score of 79. Fellow pizza chain Pizza Hut received a higher ACSI score of 80, as did Papa John's.